He might not be the original Ral Zarek, but he still has that same electric personality! He was clearly built with this set in mind, where you can pitch an instant or sorcery into your graveyard to have it still accessible through the new Jump-start mechanic. This guy is going to fit better into Spellslinger decks that aim to win over long games rather than those that try to combo off early. His -3 can kill any number of creatures pretty early, but will get more destructive later on. However, his ultimate ability is one of the first I’ve seen in a while that I’d label as the main reason I’d consider running the planeswalker. That emblem can just take off and provide massive amounts of damage by turning any spell into a double cantrip. I’m a big fan! 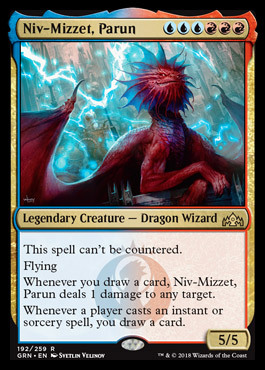 Niv-Mizzet 3.0. Niv has certainly gotten a massive buff, but does that warrant this new huge drawback? Adding the ability to cantrip every single instant and sorcery is a huge improvement, as is his ability to avoid counterspells. However, you may have a hard playing this creature when you want it. This is one of very few dual-colored decks where I feel like Chromatic Lantern has to be included, because Niv needs three blue and three red mana. 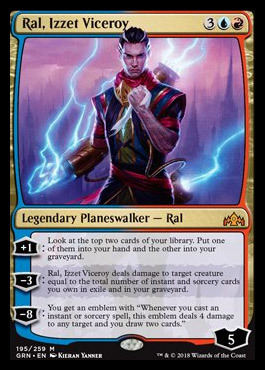 That’s going to be hard to achieve, and a significant portion of artifact ramp in Izzet is going to be useless in accelerating his entering the battlefield. I think he’s going to be a huge Storm enabler and spellslinger commander, but that hurdle of extra colored cost is going to be difficult. Remember when they came out with a list of abilities and mechanics ranked with how likely they were to see a reprint? What was it called again? Oh yeah. The STORM SCALE. 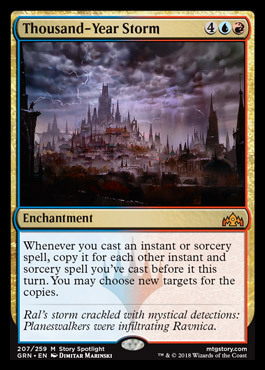 Named after how Storm was likely to never be printed again, they decided to instead give every single instant and sorcery you cast Storm instead. Because who doesn’t want to see an even more explosive game of solitaire in commander for Izzet and Grixis players, right? Who doesn’t like casting Grapeshot for twice the normal amount? That being said, it is 6 mana, so its inclusion in competitive decks might be hampered by that high cost. 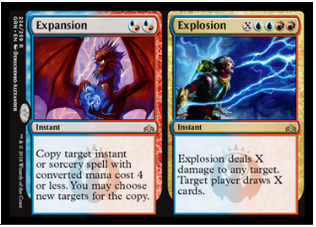 Expansion // Explosion is a cool card. The Expansion half is basically a Reverberate that is more easy to cast, but can target less spells, while the Explosion is a cool effect to do what Izzet things do: draw cards and deal damage! Other than that, I don’t have much to say. This excites me. For two mana, an enchantment that builds up charge counters doing what Izzet decks do in order to facilitate Izzet decks doing more of those things. 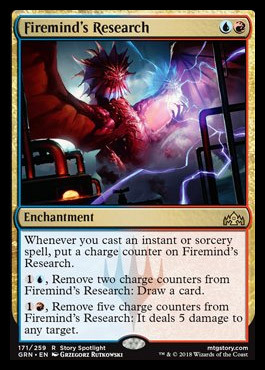 Izzet likes to burn and draw cards using instants and sorceries, so this enchantment lets you do both using those charge counters as fuel. I think this is going to be an overlooked card, and many people may not think much of it due to requiring so many charge counters for each effect, but I wouldn’t be surprised if this card exploded during some games and went under peoples’ radar to finish games. This is very comparable to Countersquall. 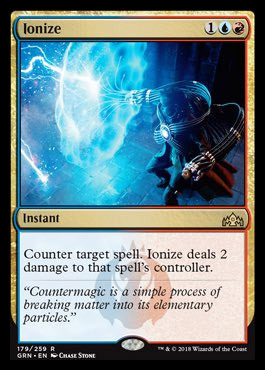 Counterspells are always good, as is dealing damage to opponents, so this is a nice two-for-one in Izzet colors. 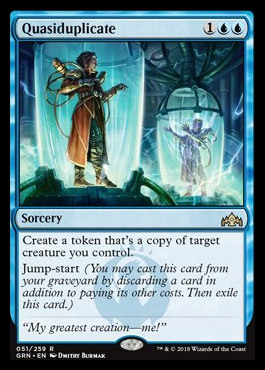 I don’t think this will see a ton of play in EDH other than as another option in decks containing Izzet colors, but will probably see lots of play in Standard and other formats. Other than that it’s a pretty standard counterspell, don’t know what else there is to say about it! Remember Cackling Counterpart? Welcome to version 2.0. Does the same thing for the same cost, but the graveyard ability is significantly different, and the new one is a sorcery. I expect this to go in the same decks that Cackling Counterpart already sees play in, though probably not as often. There is one question for Commander players out there who are choosing between these two cards. Which is more useful: the ability to pay three mana and discard a card to cast this again, or the ability to Flashback this effect at instant speed for an additional four mana, but with no discard requirement. My opinion is that in most cases I would prefer the instant speed of Cackling Counterpart. I felt that this was an important include in the article because a lot of people will probably think this is better than it actually is. Red really likes these effects, as can be seen similarly in Browbeat. These are pretty good in 60-card formats. 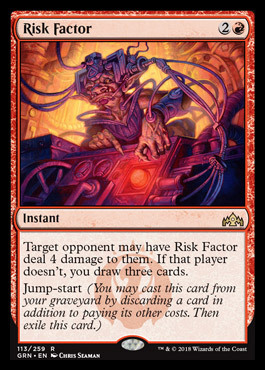 However, in Commander, not only do life totals not particularly matter in quantities that small, especially at the turn you would probably play this, but there is a fundamental problem with these types of cards. Giving your opponent the choice of mode to use on this spell will always result in them picking the option that is better for them and worse for you. You can almost guarantee that whenever you play this spell, it’s going to have the opposite effect of what you want. Mini Zada, Hedron Grinder! This is a nifty little ability that will honestly probably not see that much play. There are very few spells in the average instant and sorcery spell-slinging deck that will target a single creature you control that you would want to hit every other creature. 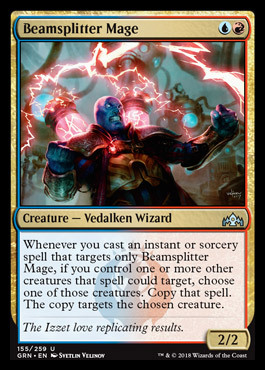 The previously mentioned Quasiduplicate would be a cool spell to cast to basically clone your board, but most of the time the spells that would be used on this guy probably just aren’t impactful enough to be included in a Commander deck unless you’re running Zada already, who can just do this guy’s job better. Do you think any of these Electrifying cards fit in to more decks than I did? Would you evaluate any differently? I picked the ones that I foresaw being played in Commander the most, so there are quite a few I left out because I didn’t want to Muddle the Mixture with any that I don’t think will see play. I’d enjoy hearing your thoughts and comments below! Stay tuned with my articles for a Playgroup Brews coming out next week evaluating five of the new Guilds of Ravnica commanders! Until then, good luck in the prereleases! May every pack contain a Shockland, may your topdecks be incredible, and may your opponents be forever mana screwed.